We completed our Parisian task. We had our share of French pastries! Below is Janice's chocolate pastry for breakfast. Our day this last full day in Europe would include a bus tour through the city, a visit to the Musée de l'Orangerie and the Louvre. Our first hop-off stop on the bus tour was at the chapel at the Invalides, originally a hospital for injured French soldiers. Twenty years after his death, Napoleon's remains were moved to this chapel. We didn't go in to see him, just took a quick photo and hopped back on the bus. 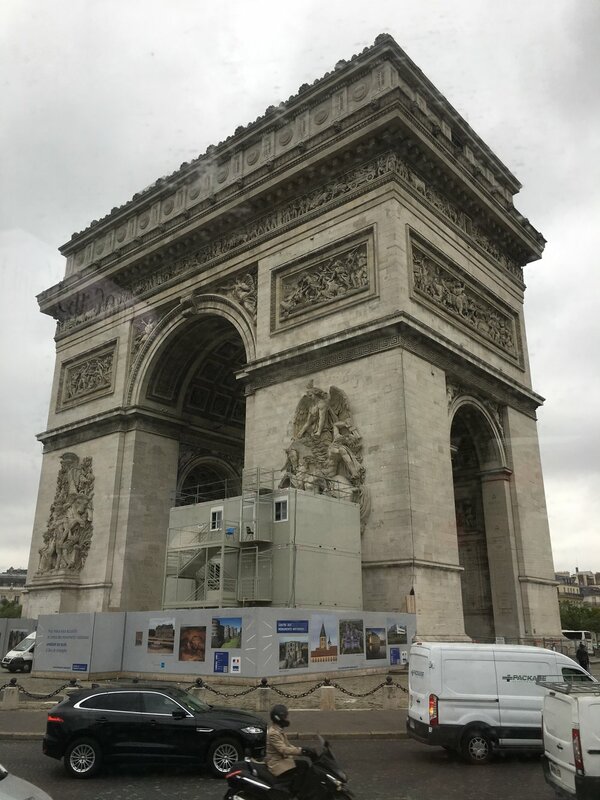 A view below from the bus of the Arc d'Triomphe. An interesting fact about the traffic circle that goes around it is that twelve streets intersect the circle at regular intervals, so a view from above shows a large star shape. Another view of this couple that we kept seeing on this trip . . .
My lunch plate at a park café between the Musée de l'Orangerie and the Louvre. Yummy! Janice snapped the photo below of one of the flower beds as we entered the arms of the Louvre. An arc through which we walked on our way to the glass pyramid beyond which was our entry point into the Louvre. The main entrance to the Louvre. There were a lot of people here this day, but I am sure it was not as many as have been here on other days. A view of one side of the Louvre from the glass pyramid. A bust of Dean when he had a full head of hair. Some of the French crown jewels. This is what Janice most wanted to see, and though I was able to get the photo below from behind about 50 people, she got to within about three or four people of it. It was a mad house in this room, with many younger women getting to the front of the crowd and then staying there primping and taking selfies. 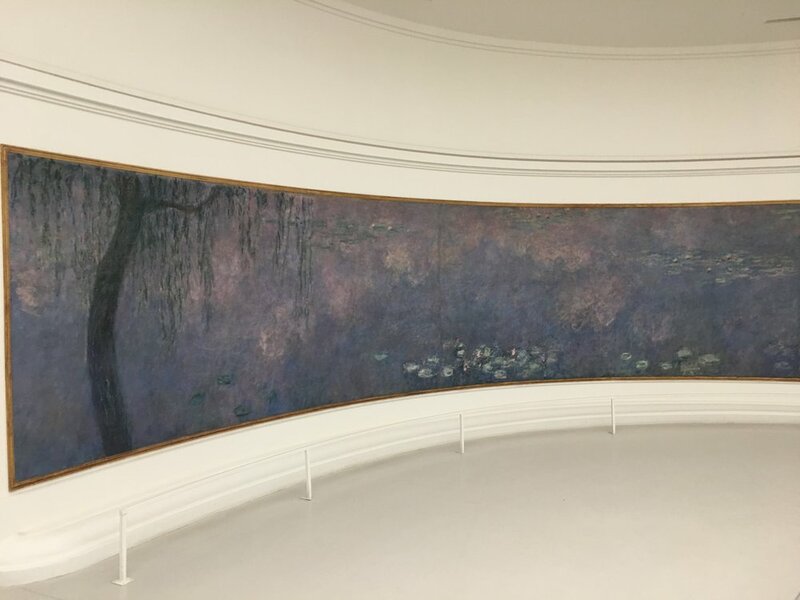 That was a real disappointment as folks who were just there to see and enjoy the paining were not able to do so very well because of the crowd of people that just wanted selfies. 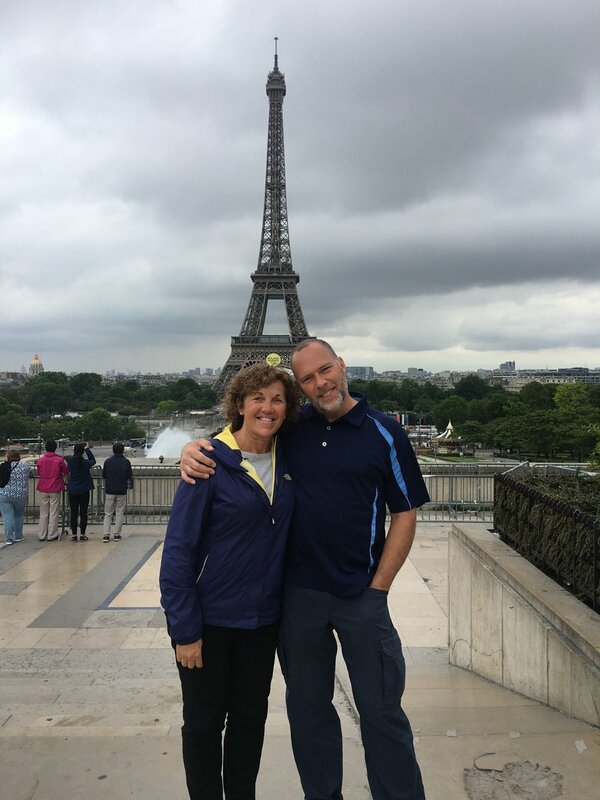 In spite of the crowd in front of the Mona Lisa, we had a great time at the Louvre, in Paris, on this entire trip. We really enjoyed all the sights, and though we weren't looking for more friends, we did make many of them and I really expect that we will stay in touch with a number of them. I hope that some of you may be able to take such a trip to Europe sometime. And if you do, we could pass on a couple of tips if you'd care to hear them. Thanks for the time you spent keeping up with us as we had this great adventure!